KATHMANDU - Twenty Nepali climbers are setting off to Mount Everest this week to try and remove decades-old garbage from the mountain in the world's highest ever clean-up campaign, organizers said on Monday. Many foreign and Nepali climbers have cleaned Mount Everest in the past but Namgyal Sherpa, leader of the Extreme Everest Expedition 2010, said no one had dared to clean above 8,000 meters , an area known as the "death zone" for the lack of oxygen and treacherous terrain. Sherpa and his team of seasoned climbers, carrying empty rucksacks and special bags, will risk the zone's thin air and freezing temperatures to pick empty oxygen bottles, gas canisters, torn tents, ropes, and utensils lying between the South Col and the 8,850 meter summit. "This is the first time we are cleaning at that height, the death zone. It is very difficult and dangerous," said Sherpa, who has climbed Everest, the world's tallest peak, seven times. "The garbage was buried under snow in the past. But now it has come out on the surface because of the melting of snow due to global warming," the 30-year-old said. "The rubbish is creating problems for climbers ... Some items of garbage are from Hillary's time." The mountain has become known as being the world's highest garbage dump. Many climbers leave their gear and trash behind as they descend due to exhaustion and lack of oxygen. New Zealander Sir Edmund Hillary and Nepal's Tenzing Norgay Sherpa were the first to ascend to Mount Everest's summit in 1953. That feat opened Nepal as a popular tourist destination. More than 4,000 climbers have since scaled the mountain and tourism, including climbing, is a key source of income for Nepal, among the world's poorest countries. 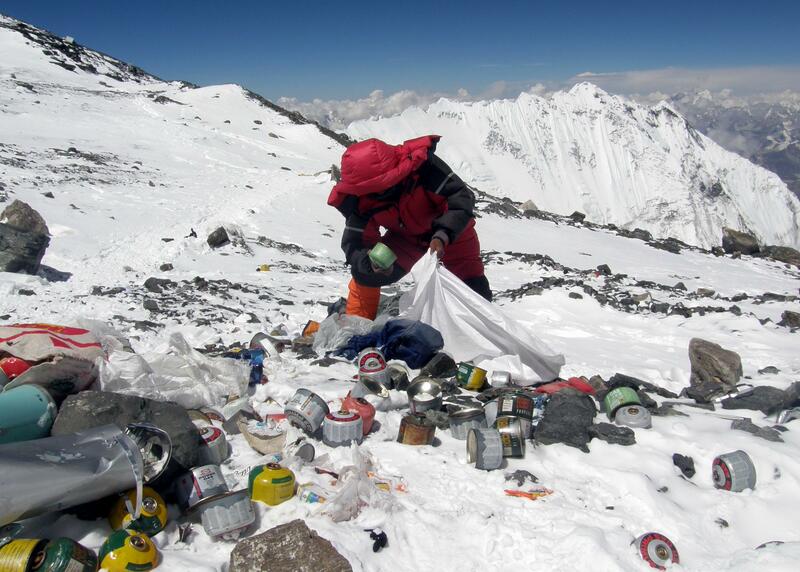 Sherpa's team hopes to bring down at least 2,000 kg of garbage and the corpse of a climber killed two years ago. "I have seen three corpses lying there for years," Sherpa said. "We'll bring down the body of a Swiss climber who died in the mountain in 2008 and cremate it below the base camp for which we have got the family's consent." After many years, this movie was finally released. Incredible story. 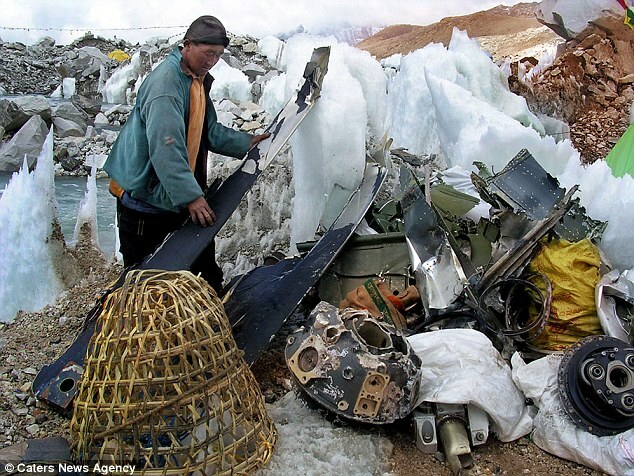 Such irony where climbers typically champion protecting the environment are littering all over the mountains, oxygen tanks, food packaging, sleeping bags, all discarded in the "death zone" where ownself survival is more critical than anything. Every year there's a few deaths on the climb and over the years, the bodies were just left there as it is both dangerous and expensive to bring them down. Estimated 200+ dead bodies on Everest. In the documentary, the Sherpas risked their lives to extract two bodies - Russian (climbed alone) and Swiss (climbed without oxygen). Finally, the authorities are cutting climbing permits and hopefully will enforce stricter laws. Athird fewer climbers will be allowed to attempt Everest from the north this year as China plans a major clean up of the world's highest peak. The total number of climbers allowed to try to conquer the mountain from the north will be limited to fewer than 300 and the climbing season will be restricted to the spring, state media reported. The clean up will also include the recovery of bodies of climbers who have died on the upper reaches of the 29,035ft mountain. Edited by Roadrunner2029, 14 February 2019 - 10:03 AM. Set up ERP on Mt Everest. You don't know how much is a climb permit right ? Enough to buy a KIA Stonic here.